Firstly, I want to thank my fellow blogger Made in Suisse for her post about creative wrapping paper. It was the starting point of this venture! Secondly, I would like to add that you can wrap any kind of gift with this wrapping paper - not just Christmas gifts! For most people the end of December is the time of the year they finish buying their Christmas presents. Well, for some people it's only starting but that's another story. Many stores here in Switzerland have a gift wrapping service and while it may be very convenient to buy your gift ready and wrapped, so to speak, I think that is rather boring. I mean, if you found an amazing gift for your husband or best friend why would you want to waste it with average wrapping? Especially, if your gift has vintage character or is home made I would advise you to give it the wrapping it deserves! This is exactly what I did today. I rummaged through the memories from my childhood and came up with this fun way to design your own wrapping paper: potato stamps. As kids we used potato stamps to decorate our aprons, t-shirts and create gifts for our relatives. It's easy and will look great on wrapping paper as well. Besides, spending some time doing handicrafts is always fun, also as grown ups! First you have to make a stamp from your potato. Actually, you can make two since you're gonna cut the potato in half. Dry the section and draw a pattern onto the potato. Make sure not to use pressure because the pen could leave traces that might later affect your stamp! Once you're done drawing your heart or star you take the knife and gently trace the lines of your drawing. You'll want to cut down at a vertical angle towards the surface of the stamp for best results. Afterwards cut away the pieces that are not part of your pattern. The stamp is now ready for use. Second, take the wrapping paper and spread it on the table. You can either cut it up in squares or rectangles that fit your gifts or simply use a whole roll of wrapping paper. Choose a color that matches your wrapping paper and daub the patterned side of the stamp with a bit of paint. Then press it on the wrapping paper and lift it up carefully. Chances are that you won't get the right amount of paint the first time so make sure you have some newspaper nearby where you can test your stamp. As soon as you get the hang of it, stamp freely on your wrapping paper. Personally, I like random patterns with a mixture of two or three colors on a single colored wrapping paper. ;ore regular patterns might look neat as well and total chaos certainly has it's attraction as well. In the end, whatever you like is what will work for you. 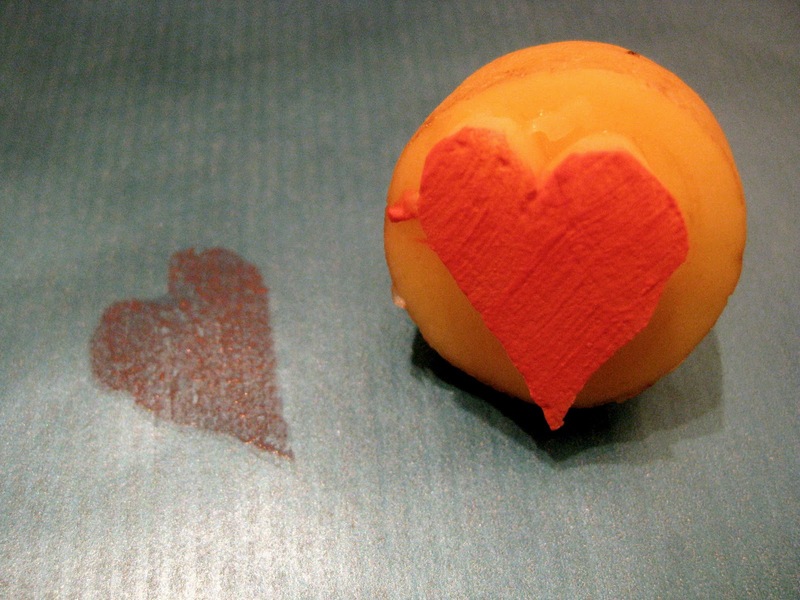 TIP: If you get bored with your stamp, you can simply cut off the top layer of the potato and make a new one! Once you're done imprinting the wrapping paper put it aside and let it dry. The paint has to be really dry before you wrap your gifts with it, especially if you're using acrylic colors since they don't wash out easily. I accidentally left marks on my table while wrapping my gifts; thank God I could wipe them off. Once dry you can use your wrapping paper to wrap the gifts. Use a piece of yarn or lace to tie them up nicely since they go well with classic patterns. Funky colored wool or twine look great with more colorful patterns. Let your creativity decide! As you can see, my gifts were wrapped in a wintery blue with stars, hearts and snowflakes! I used simple yarn to tie around them. I'm not gonna tell you what is inside them though! Happy wrapping paper making to everyone! You have something to add or would like to ask a question? I would love to hear from you! As an expat one usually spots fellow expats right away. It's not only the language or the looks of people but rather the little peculiarities of life that seem so normal at home that give us away while abroad. Obviously, it's a cliche that all people from the same place (country, city, continent) behave in the same way and I am far from making that claim. However, growing up in a certain surrounding does rub off on people's behavior and some similarities can certainly be observed. This is also true for Swiss people. According to the Swiss stereotype, we are a clean, punctual and strictly organized people. However, there are many exceptions like my Swiss friend who is always late or my brother whose room was a total mess while growing up. Yet, although they do not fit the description of a typical Swiss person, they still have some traits that give them away as Swiss. The same is probably true for myself - if I like it or not. If you've ever been invited to the home of a Swiss couple, you are probably familiar with the most popular Swiss German term of endearment "Schätzli" (little treasure) or one of it's many varieties like e.g. "Schatz" or "Schätzeli". Obviously, this is not the only pet name used by Swiss couples (or parents for that matter). Like many other languages, Swiss German offers a wide variety of words and phrases that you can use to address your loved one. What most of these pet names have in common is the ending "-li" which basically turns the thing or person a word refers to into something small. For example "Haus" means house and "Hüüsli" means small house. This ending "-li" can also be added to first names as a means of endearment, e.g. Benjaminli, Estherli or Fabienneli.